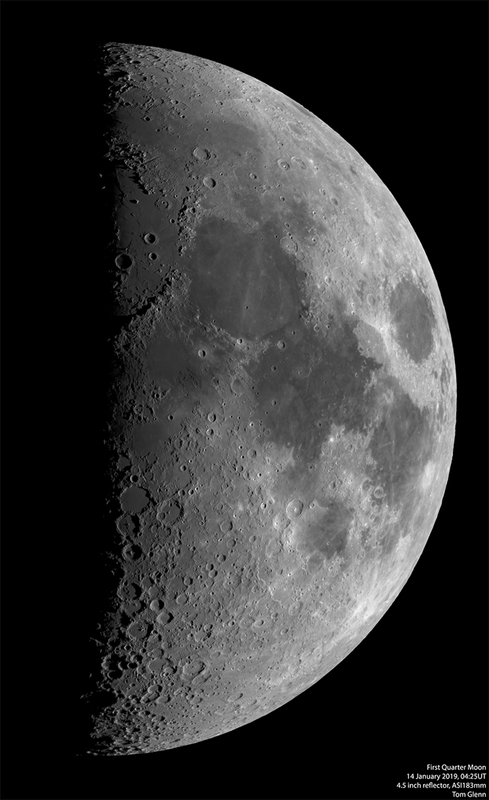 Here is an image I took last week of the First Quarter Moon using my 114mm (4.5 inch) reflector and ASI183mm and a green filter. Click for full size. I wish I could say I was getting ready for the lunar eclipse, but it looks doubtful with the weather forecast. Even though it has been sunny all day yesterday and partially sunny today (and will be sunny again tomorrow) there is a strange forecast for rain tonight, a very isolated set of showers that is looking to ruin the eclipse. Edited by Tom Glenn, 20 January 2019 - 06:34 PM. Tom, that's a nice shot and you resolved all of the Apollo 11 craters (Armstrong, Collins, Aldrin) and several of the smaller craters around Rima Hyginus that I missed with my AT72ED. I'd really like to find a 4" f/8 Newtonian, but as far as I can tell no one makes mirrors like that any longer (well, you can still get a 4.3" f/8 mirror from Edmunds but it costs $440 and it's just a little too long to frame the full moon with the IMX183). I want something that has a focal length no longer than 830mm and most of the 4" class mirrors are just a little bit longer than that. As for tonight's eclipse, I suspect this is going to be the eclipse that never was for a lot of observers in the U.S. as the weather seems pretty bad almost everywhere (and certainly no joy for most of California and the west coast, the midwest, and the upper northeast). 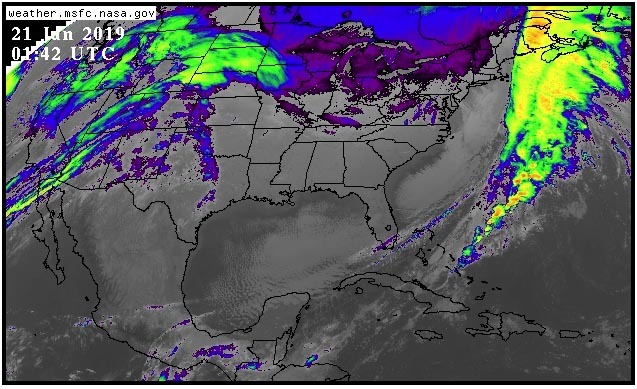 The southeast, however, looks pretty good. Which 114mm Newtonian are you using? From his Flickr link it says Meade 4.5", so not sure which one, but are there many models or it is only one Meade 114mm [4.5"] model? So that camera and that scope can fit the whole moon just fine. Actually, Tom's Newtonian shouldn't be able to fit the full moon on the IMX183 sensor, at least not when in the full or late gibbous phase and when the moon is closer in its orbit to the earth. Under the latter conditions I don't think you can go much over 800mm in focal length. Something like the first quarter moon is pretty easy to fit, since you can orient the longer axis of the camera to the greatest extent of the moon. As for good 4" reflectors (f/8 or slower), there aren't very many that are still being made. Below is a link that discusses some of the older models. Note, if you go much below f/8 you are going to have problems with field coverage on the moon, so the edges of the field may not be very sharp (on the moon). It appears you can still get the 4.5" Orion Dobsonian (f/7.9 with a focal length of 900mm), but as I mentioned earlier that's probably too long of a focal length to image all phases of the moon with the IMX183 (unless you do a matrix, with more than one frame). Also, I'm not sure whether all of these 4" Newtonians can be used with a camera like the ASI183 or QHY183, since they MAY not have enough backfocus for that style of camera. Worse case, I guess, is that you could reposition the primary mirror to try and move the focus a little further out from the end of the focuser. Edited by james7ca, 25 January 2019 - 04:42 AM. It is ok, no necessary to use only that 4"-5" Reflector for the moon, there is still refractors can do the job just fine, and with 4" or 5" Newt it can fit full moon too if using larger sensor cameras maybe, there is Skywatcher 114mm reflector cheap one, can't be sure they are any good quality, it has F/4.83 i think, and ASI183 or even my camera QHY163M can fit the full moon with that scope. Thanks James, George, Bruce, and Tareq for the comments. This post sort of got put on the back burner while I was dealing the eclipse, but thanks for the kind words. George, the scope is an old Meade that I picked up from a friend of mine. They stopped making the model years ago, but it is very similar to an entry level 4.5 inch F/9 such as the following, although mine has a 910mm focal length and is F/8. Celestron also makes a nearly identical model. It is an entry level scope, and not designed for serious use or imaging, but it actually manages to produce fairly astounding results considering. At most phases, the entire Moon does fit onto the IMX183 sensor, although as James pointed out, if the Full (or nearly full) Moon is close to perigee, then it will not quite fit along the short axis of the sensor. I have very recently purchased a new scope to replace this one, that has a nearly identical focal length but with 6 inches of aperture. I used this in combination with a DSLR for the lunar eclipse, although I only had the scope for a few days and had not yet had time to really dial in the collimation. As a result, there is some coma in some of the stars in the field, but I have been tinkering with collimation and the coma corrector, and will soon make a post with some new images. The old 4.5 inch Meade needed replacing, because the focuser was terrible, and the secondary mirror holder was actually broken and was being crudely patched with duct tape. Nevertheless, it still works well although it's kind of a pain to use for those reasons. I like having something that can fit the entire Moon into one frame, because with the small pixels of the IMX183 sensor, one can still achieve very nice resolution despite being under-sampled for the aperture (ideal sampling requires ~F/12 for the 2.4um pixels, but then the Moon definitely does not fit into one frame). For even more resolution, I have a C9.25 Edge, and that produces great results in combination with the IMX183 sensor, but requires mosaics for the entire Moon, and even with just a few panels, this significantly adds to the workflow on both the capture and processing side (even more so at higher resolution because any flaws are more visible). Therefore I only like to take that approach when conditions are very good. At other times, it's more fun to get a quick capture in a single video. Edited by Tom Glenn, 25 January 2019 - 05:49 AM. Celestron also makes a nearly identical model. It is an entry level scope, and not designed for serious use or imaging, but it actually manages to produce fairly astounding results considering. At most phases, the entire Moon does fit onto the IMX183 sensor, although as James pointed out, if the Full (or nearly full) Moon is close to perigee, then it will not quite fit along the short axis of the sensor. I have very recently purchased a new scope to replace this one, that has a nearly identical focal length but with 6 inches of aperture. I used this in combination with a DSLR for the lunar eclipse, although I only had the scope for a few days and had not yet had time to really dial in the collimation. As a result, there is some coma in some of the stars in the field, but I have been tinkering with collimation and the coma corrector, and will soon make a post with some new images. The old 4.5 inch Meade needing replacing, because the focuser was terrible, and the secondary mirror holder was actually broken and was being crudely patched with duct tape. Nevertheless, it still works well although it's kind of a pain to use for those reasons. I like having something that can fit the entire Moon into one frame, because with the small pixels of the IMX183 sensor, one can still achieve very nice resolution despite being under-sampled for the aperture. For even more resolution, I have a C9.25 Edge, and that produces great results in combination with the IMX183 sensor, but requires mosaics for the entire Moon, and even with just a few panels, this significantly adds to the workflow on both the capture and processing side (even more so at higher resolution because any flaws are more visible). Therefore I only like to take that approach when conditions are very good. At other times, it's more fun to get a quick capture in a single video. Ok, i have a Meade 8" F5 Newtonian which gives FL=1000mm, so close to this one you have, and i am using QHY163M, so sounds it can fit for half moon then. The sensor on the QHY163 is actually larger than the IMX183, so the entire Moon would fit with your combination, even at the Full Moon, although the pixels are larger on your camera (3.8um versus 2.4um), so the resolution would be lower. But it will definitely fit nicely. The only thing is that at F/5, you will need a coma corrector, because only a very small region at the center of the optical axis will be free from comatic aberration. And also collimation is critical, because if you are slightly miscollimated, then you can still have coma even with a coma corrector because the center of the optical axis will not coincide with the center of the imaging train. Even my new F/6 scope has significant coma without using a coma corrector, and the faster the scope, the worse it gets, and the more critical collimation becomes. Edited by Tom Glenn, 25 January 2019 - 05:57 AM. We will check out that and see what we can do, after all i bought this scope for galaxies, so there are stars, not the moon and no stars, i do have a coma corrector so this is done, i just only need to check out the collimation if possible, many said they managed to do fine with F5 Newtonian, it is more headache with F4 or faster, in all cases the results will tell me if things are right or wrong. As Tom pointed out coma can become a problem at faster f-ratios and the coma-free field goes by the inverse of the cube of the f-ratio. So, an f/5 Newtonian has a coma-free field that is only 5^3 / 8^3 ≈ 24% of that provided by an f/8 system. One of the reasons why a 4", f/8 Newtonian would be good for lunar imaging with a sensor like the IMX183 is that the coma-free field is about the same size as the sensor and thus the entire surface of the moon should appear pretty sharp. Also, that scope's focal length is around the 800mm mark, so the entire disk of the moon will fit within a single frame on the IMX183. However, to the best of my knowledge there are no 4" Newtonians (104mm diameter) that are currently being made at an f/8 ratio and as has been pointed out a 4.5" (114mm) f/8 Newtonian is just a little bit too long to image the entire disk of the moon. In place of the Newtonian I've been using an AT72ED refractor at around f/11 (with a barlow) since that produces a focal length just under 800mm which is also pretty close to the critical sampling for the IMX183 (that's at f/12, for green light). Another point to consider, I've been using this combination for more than a full month and I've yet to have seeing conditions that can take full advantage of even this small refractor. So, I'm kind of waiting to see what will happen when I have a night with good seeing. Also, this thread has images from my AT72ED with the ASI183MM camera. Edited by james7ca, 25 January 2019 - 08:11 PM.